Picking up the ‘Art’ posts that I used to do on Sundays… In my collection of fairy tale books, my favourite artists are Arthur Rackham and Edmund Dulac. 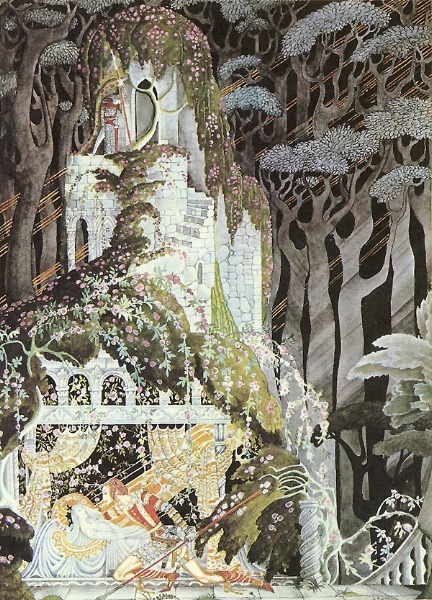 To this list, I add Kay Nielsen with his elegant, otherworldly images; so suited to fairy tales. Kay (pronounced ‘Kigh’) Nielsen was born in Copenhagen in March 1886. His parents were both actors; his mother, Oda Nielsen, was a famous actress of her time. But, instead of following his parents into the performance arts, Nielsen found his passion in illustrations. He studied art in Paris from 1904 to 1911, after which he moved to England and lived there until 1916. His first commission was from Hodder and Stoughton. He produced colour plates and monotone illustrations for ‘In Powder and Crinoline, Fairy Tales Retold’ by Sir Arthur Quiller-Couch (1913). 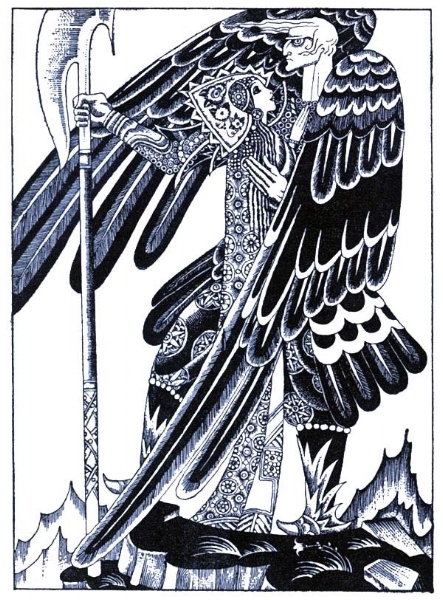 Later that same year, Nielsen was commissioned by ‘The Illustrated London News’ to produce more fairy tale illustrations, this time for the tales of Charles Perrault. He created four illustrations – ‘Sleeping Beauty’; ‘Puss in Boots’; ‘Cinderella’ and ‘Bluebeard’; they were published in the news magazine’s Christmas edition of 1913. In 1914, he produced a substantial number of illustrations for ‘East of the Sun and West of the Moon’ – 25 colour plates and more than 21 monotone images. Nielsen also produced at least 3 illustrations based on the life of Joan of Arc. While in Dover, where he painted landscapes, he was introduced to The Society of Tempera and learnt new skills, namely how to reduce time in the painting process. In 1917, Nielsen was invited to New York to exhibit his work. When the exhibition ended, he returned to Denmark where he painted stage scenery for the actor and director, Johannes Poulsen, at the Royal Danish Theatre. At this time, he was also working on other illustrations, namely for a translation of ‘The Arabian Nights’. According to Nielsen, he’d intended to use them to signal his return to book illustrations following a break during the First World War. The plan was to publish the Danish version alongside English and French versions. Sadly, the project was never realised and these illustrations weren’t found until many years after his death. In 1924, Nielsen was asked to illustrate another collection of fairy tales, this time by his fellow Dane, Hans Christian Andersen. ‘Fairy Tales by Hans Andersen’ included 12 colour plates by Nielsen, along with more than 40 monotone illustrations. The following year, he produced 12 colour plates and over 20 monotone images for ‘Hansel and Gretel, and Other Stories by the Brothers Grimm’. Five years later, in 1930, Nielsen illustrated what would be his final title, ‘Red Magic’, with 8 colour images and over 50 monotone illustrations. The book was ‘a collection of the world’s best fairy tales from all countries’, edited and arranged by Romer Wilson. Unfortunately, though these images have captions, they lack story titles. In 1939, Nielsen made the move to America, namely California, where he worked for Hollywood companies. He was given a job with The Walt Disney Company following a personal recommendation from Joe Grant, a character designer and story artist. Grant’s work included the creation of the queen in ‘Snow White and the Seven Dwarves’; he also co-wrote ‘Fantasia’ and ‘Dumbo’. Nielsen’s work was used in the ‘Avé Maria’ and ‘Night on Bald Mountain’ sequences of ‘Fantasia’. Despite producing beautiful artwork, Nielsen was let go in 1941. Whereas the company worked at a fast pace, Nielsen took his time with soft pastels, paying great attention to detail. However, the concept work he’d done for ‘The Little Mermaid’ was used years later, in 1989, and he was given credit for it. Greatly disappointed, Nielsen returned to Denmark but found no solace; his work was no longer in demand in his home country. With poverty knocking on his door and burdened with a persistent chronic cough, he returned to Los Angeles. There, he found work painting murals for schools and churches. On June 21st 1957, Kay Nielsen died, aged 71. His funeral service was held under the mural he’d painted in the Wong Chapel at the First Congregational Church, Los Angeles. His wife, Ulla, died the following year. After Nielsen’s death and before her own, Ulla gave his illustrations to Frederick Monhoff, an American artist and architect. He tried to place them in museums in America and Denmark but, sadly, none would accept them. It would be many years before the art of Kay Nielsen would, once again, be appreciated.